"Helping YOU ~ and SMART COOKIES everywhere ~ make a GOOD IMPRESSION!" 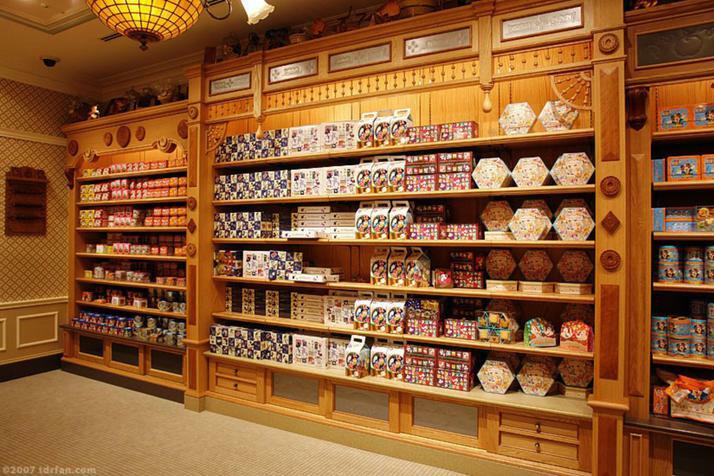 ​ Scroll down to the bottom of this web page to see a photo of Disney's Tokyo Confectionery cabinetry utilizing Gene's molds. 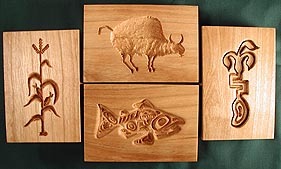 Later in 2005, Smithsonian executive chef Richard Hetzler submitted designs [used at the National Museum of the American Indian in Washington DC] to Gene, asking him to carve these designs as cookie molds for shaping large shortbread cookies. 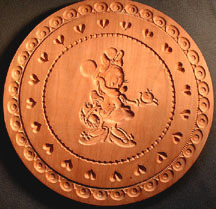 The Indian design molds carved by Gene (shown below) were used by Maribeth's Bakery of VA for shaping Smithsonian cookies sold at the museum. 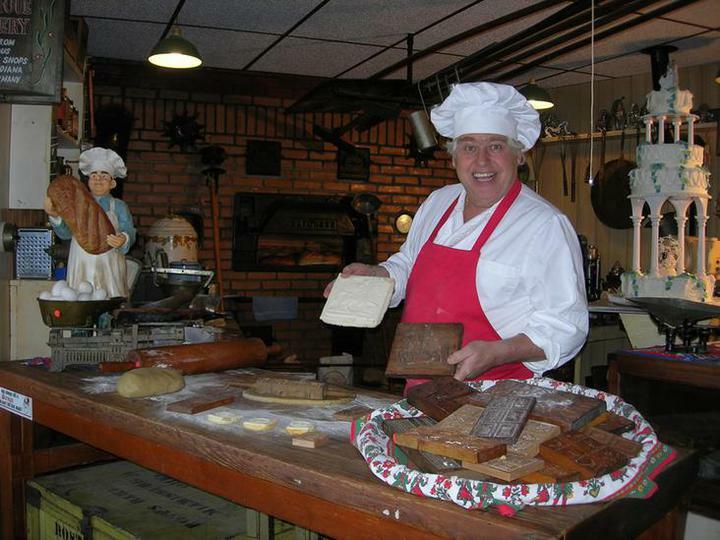 Gene and June recently visited with the "Happy Baker" Juergen Jungbauer [J.J.] in Indianapolis. He was a delight as was his Cafe, Gift Shop, Museum, and Bakery. 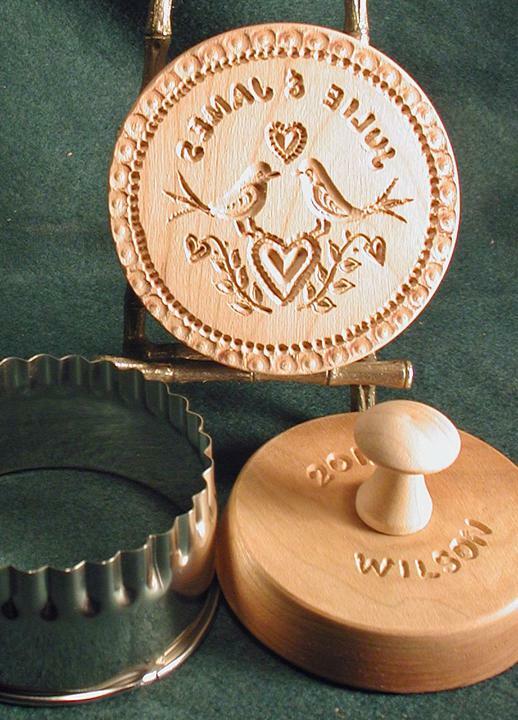 Wedding/Anniversary Molds & Stamps: Our popular beech wood Penn-Dutch Wedding Heart Mold is being offered again for the first time in several years. 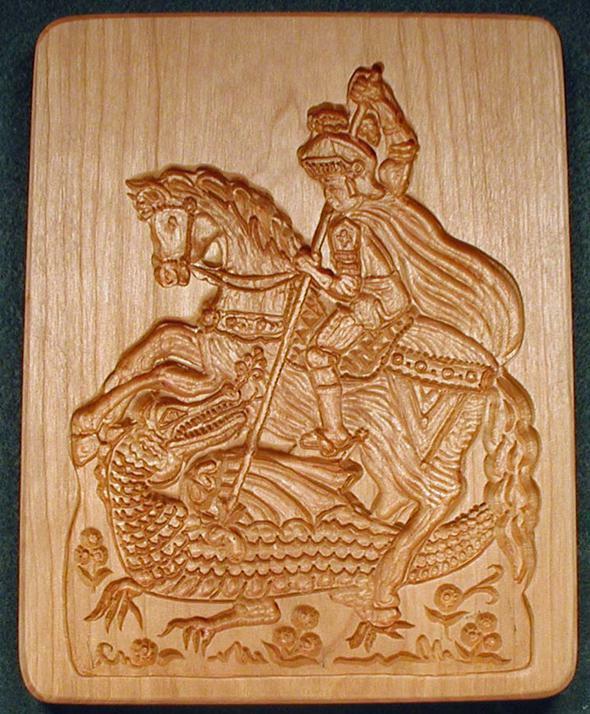 It is offered in American cherry wood. 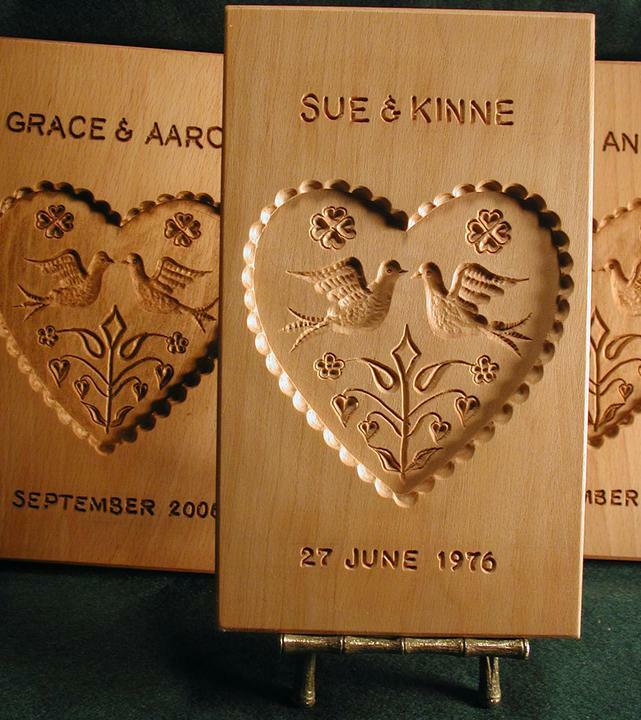 Another popular personalized item, the Lovebirds Wedding Stamp, has been redesigned and resized... see it on our new Personalized Molds web page. Additional personalized molds have be added include: Rag Doll, Gingerbread Boy, Gingerbread Girl, Rocking Horse, Teddy Bear and ​Alpine Boy. One of Gene's newest designs is a large, deep-cavity Santa mold carved in premium American cherry wood. 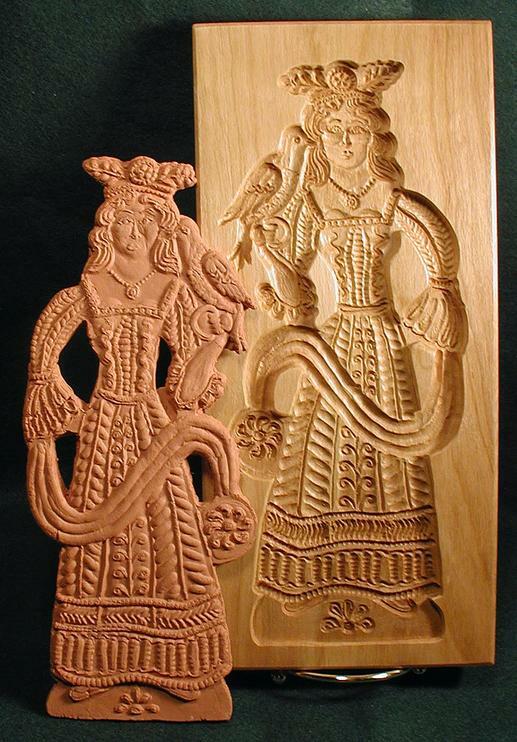 It shapes 10" tall figure cookies that have all the hallmarks of molds carved in Germany a century ago. 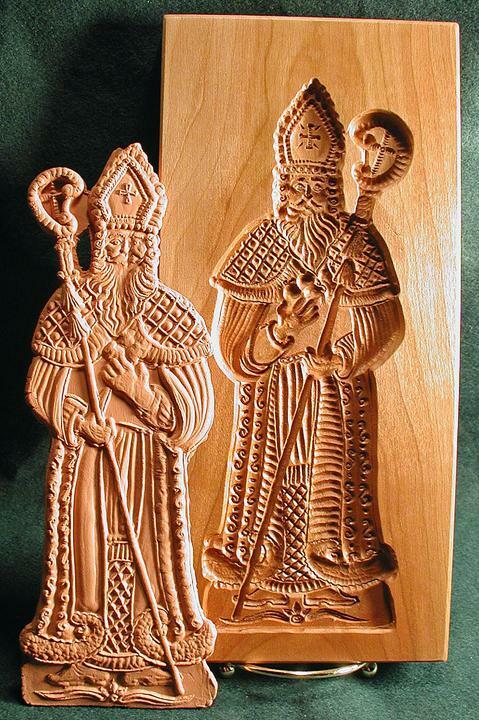 This mold fulfills the request of our customers who have asked Gene to carve an antique-inspired Santa equal to his large, foot-tall Saint Nicholas mold​. Gene's nephew. Allen Buchheit, has been working as an apprentice for over two years. 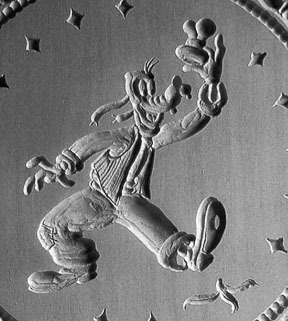 He has shown the interest and patience needed to develop the skills of a cookie mold carver. Hopefully, his interest and carving skills will continue to develop so as to allow an eventual transition of HOBI COOKIE MOLDS from the Wilson to the Buchheit family. 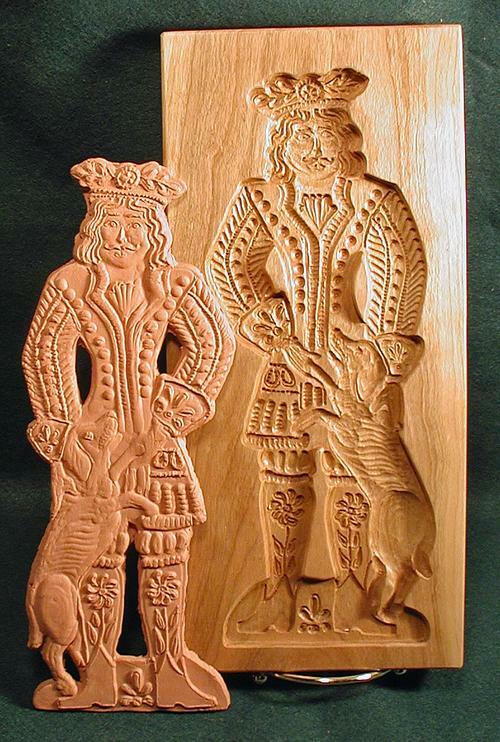 The Annual Belleville Woodcarvers Show (early November each year features 100+ designs of our molds displayed at our 32' booth at the front of the Belle-Clair Expo Hall (Fairgrounds building). Free Parking, $4 Admission. Belleville's Kriskindlmarkt on the city square [Nov. 23rd 'til Dec 23rd] includes a display and of Gene's most popular holiday design available for purchase..
​Belleville Illinois hosts one of the finest Art Shows in the country ART ON THE SQUARE, one of the oldest wood carving shows in the country, and now hosts an increasingly popular Christkindlmarkt! The half-round prints of the Vigilant Cow and American Eagle are now available. A variety 3-pc 1/2 Lb molds (bowl, carved round, handle) and a variety of butter bars for printing 1/4 lb. sticks of butter is planned for offering this winter.